I recently saw this post on LinkedIn and wondered why some users were surprised by the negative comments it received. Well, are you guys trying to turn LinkedIn into the new Facebook or are you just submitting the same posts to all your social media platforms? Whichever it is you need to stop doing it because the first rule of social media marketing is to tailor your message to your audience. Online word of mouth can be an important influence on business decision making, but only if it is relevant and supportive of your proposition. LinkedIn is a professional networking site for making contacts and sharing useful content. 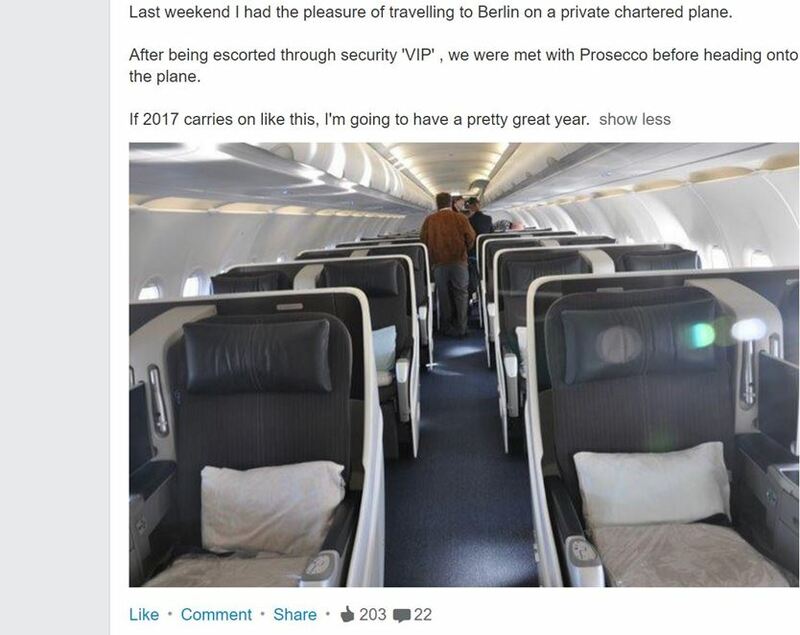 It is not for boasting about how lucky you are to have been on a private jet. Enjoying yourself at work is important, but LinkedIn is not the platform to distribute this kind of self-congratulating twaddle. It’s unprofessional and annoying to other users. Indeed, if I was a potential client of the agency concerned I would question their fees if they can afford to send employees on a private charter plane. Maybe the charter plane was paid for by a client or someone else, but that’s not the point. It creates that thought in your brain that is how my fees are being spent. These types of posts also dilute the effectiveness of the LinkedIn timeline and put off users browsing their homepage. As the comment above suggests you can; “scroll on by” but just don’t expect me to scroll for very long as I can go to Facebook to read this kind of bragging content. LinkedIn is still a very effective social media platform though. Whilst the time line is getting clogged up with mediocre stuff the special interest groups are fantastic for sharing quality content with like-minded people. LinkedIn is currently my number one source of social media traffic because I spent time finding interest groups that closely match the target audience for my blog posts. The content is therefore relevant to users and I get constructive comments and good click through to my website. So I’m not against people having fun at work, but just make sure you think before you post on your LinkedIn timeline. Otherwise LinkedIn will turn into a version of Facebook that will damage its effectiveness as a networking tool. Ask yourself a few questions. How relevant and appropriate is the content to my LinkedIn contacts. Also, what will it say about me and my company to other users on LinkedIn? The latter is the main point really. As unlike on Facebook where most people don’t give a toss where you work on LinkedIn your job title and company is very visible. Thank you for reading my post. If you found it interesting please share using the social media icons below.